The cause of freedom is not the cause of a race or a sect, a party or a class – it is the cause of humankind, the very birthright of humanity. Biographical Notes: Anna Julia Haywood Cooper was born on August 10, 1858, in Raleigh, North Carolina. Her parents were was Hannah Stanley, an enslaved Black woman, and George Washington Haywood, her master. Cooper’s extraordinary intellectual talents were evident at an early age, and by the age of 8 she was made a “pupil teacher” at St. Augustine’s Normal and Collegiate Institution, a school for free Blacks. In 1881 Cooper, who already knew Greek, Latin, and Mathematics, was admitted to Oberlin College. She earned her B.A. and M.A. degrees at Oberlin. In 1925, at the age of 67, she earned her Ph.D. from The Sorbonne in Paris, France. 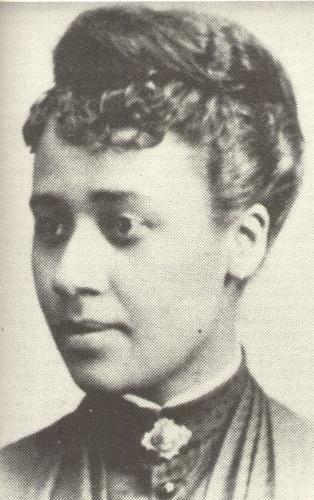 Anna Julia Cooper spent much of her life as an educator, a feminist spokesperson, an anti-racist activist, and an advocate for pan-Africanism. She died in 1964, at the age of 105. For a detailed biography of Anna Julia Haywood Cooper, click on THIS LINK to her profile on the Voices from the Gaps website.